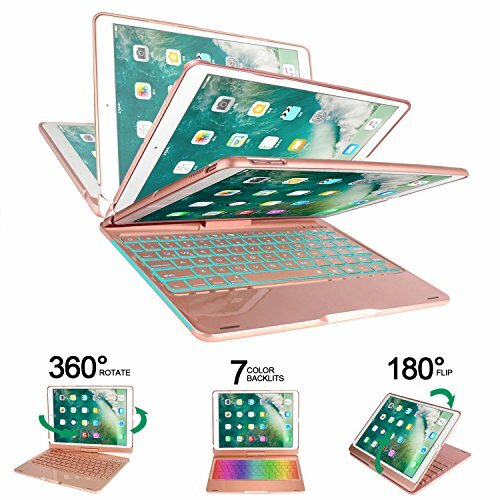 The keyboard case is exclusively designed to provide protection and only fit for iPad Pro 10.5 inch ★ A1701 or A1709 ★ , will NOT FIT for iPad Air/iPad Mini or any other iPad or tablets! Design with two breathing lights on both sides of the keyboard, make its appearance very cool. Turn your iPad into a fashionable laptop in seconds! PLEASE NOTE: You can find your tablet model number at back cover of your iPad. The keyboard cover with 360 degree rotation and 180 degree flip provides free angle for comfortable typing and viewing position. Great for both men and women, its also suitable for boys and girls in school to watch movies. Made of durability cover with aluminum alloy base which can keep your iPad protected from scratches and bumps when the case is closed. This keyboard backlight is so convenient with multiple color selection and brightness. Even if in the dark or in low-light situations, you can use the keyboard at will. Easily open or close the case can wake up or put iPad into sleep to keep battery life if non-use for several minutes. Soft keys, provide most comfortable typing experience. It is easy to type on, like a regular full sized keyboard. Our keyboard case offers one-year warranty and 30 days' no reason to return. ✅FULL PROTECTION KEYBOARD CASE: Made of sturdy Aluminum Alloy material, provide a decent amount of overall protection, and the hinge part has been reinforced. High-quality shell case provides full-body protection to keep your iPad free from scratches,dust,wear and tear. If you have any questions about this product by Earto, contact us by completing and submitting the form below. If you are looking for a specif part number, please include it with your message.